Help & DocumentationSystem AdministrationManaging the Metric Insights Environment Monitoring your systemWhy do I receive a Stop Running Script message on IE8 and IE9? 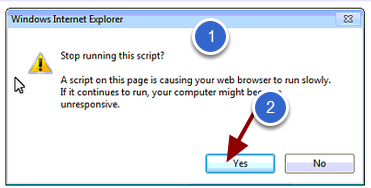 Why do I receive a Stop Running Script message on IE8 and IE9? The Microsoft Internet Explorer (IE) browsers, IE8 and IE9, provide significantly poorer performance than later versions of IE or other modern browsers. Users often see the Warning Message shown below in Step 1. There have been significant performance improvements in browsers in recent years. Metric Insights' technical specialists have found that as the volume of tiles; i.e., content in the Home Page, grows, IE8/IE9 performance becomes less than ideal. Our internal testing determined that this particular issue with IE does not go away until IE10. We also have experienced that this warning appears when you try to load a large number of tiles (well over 1,000) into the IE8 or IE9 browser. The script that is causing the issue is actually loading tile data and must be loaded completely in order to make search work on the page. We have made a number of improvements in caching and now keep both a user and a session cache of tile information that loads right away and then is synchronized with database content. This has resulted in a big improvement in page load time on modern browsers for subsequent loads of the Home Page during the same session but this does not benefit IE8 or IE9 users because these browsers do not have very good client-side caching support. Use the Dimension Editor to hide tiles of Dimensions that have a large number of Dimension Values by many of them making them not visible . For more information, see Step 4 below and/or review this article on Dimension Values. 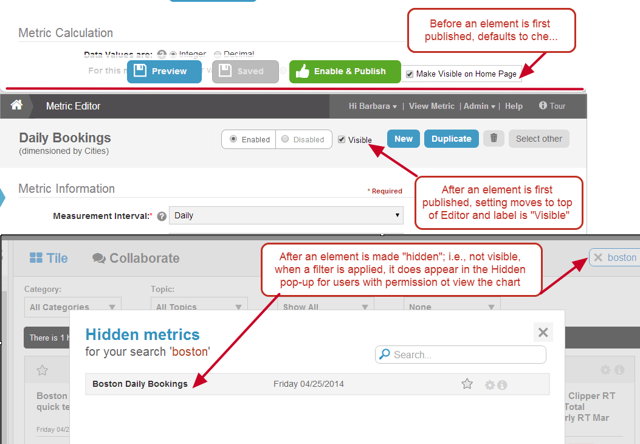 On the Home Page, you can see a list of hidden elements when you search or filter and then access that hidden content via a link that opens a pop-up with a list of hidden elements. With this capability, you can surface only a subset of content directly on the Home Page and make more detailed content available via searching or filtering. At any time, an Administrator or a Power User with edit access to an element can make it not visible on the Home Page; a setting that is especially useful for elements with low usage. Show as Tile: Set to "No"
NOTE: When a Dimension Value is hidden, all elements that use this Dimension will have this specific value excluded from the Home Page by default; however, a user can make a specific Dimension Value for an element visible in his/her Favorites section by adding that item to Favorites from the Viewer. Prev: Why didn't my data update when I recollect data? 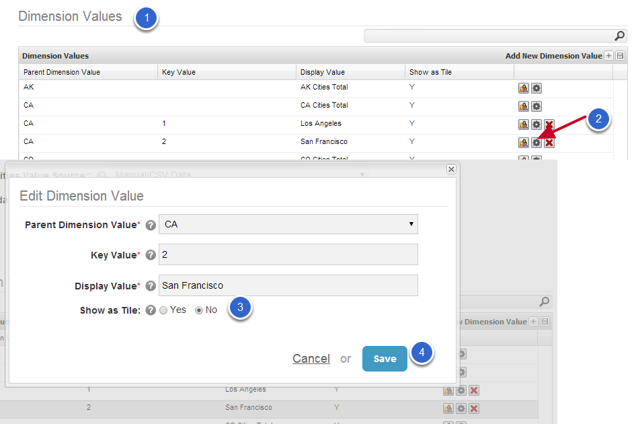 Next: Validation errors: "Value '0000-00-00' can not be represented as java.sql.Date"